Gear case (#28820) includes new 2009 re-designed heavy duty gears number 22666 capable of operating with motors up to 300 hp. 5.8 liter V8 engines. 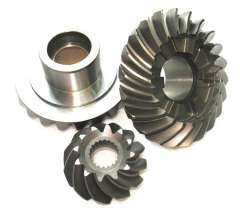 P/N 28820 Complete lower large gear housing assembly with heavy duty gears $1999.00 *after trade in. $360 core charge is refunded off purchase price after we receive your core trade in.